Mixed trading in the overnight session. Wheat currently up 2 ½ cents, corn unchanged, and beans down 4 ½ cents. An agreement was reached to end the government shutdown for 3 weeks. The USDA announced they will release the Feb 8th report as well as the Jan 11th report. These should include Dec 1 stocks, final 2018 crop numbers, and an estimate of 2019 wheat acres. 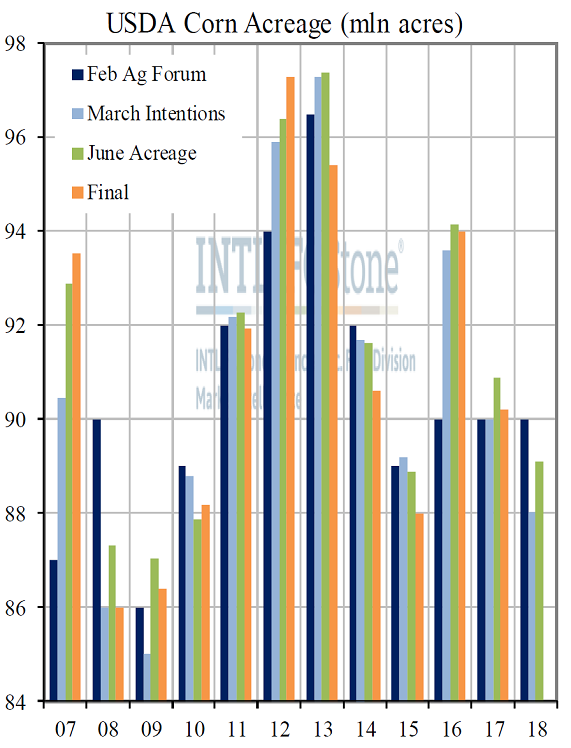 The Jan 11 report is expected to be a little friendly for corn and beans due to lower-than-expected numbers, but market may be taking that into account. U.S. and China trade delegations will meet in Washington to discuss trade later this week with expectations to carry talks into the summer; however, there could be an agreement to buy U.S. grains. Today’s chart shows historical “official” USDA corn acreage estimates throughout the growing season; the USDA has yet to issue their “final” acreage numbers in the January report, though little change is expected from the 89.1 mln ac shown in both the June 2018 acreage report and December USDA S&D. We’re moving closer to the initial Feb Ag Forum estimates, if released; the government had their initial plantings estimate at 92.0 mln ac back in Oct, though private projections currently range 0.5-2.0 mln below that.